Some devices, characters, Humongous Mecha and/or supernatural beings have the power to absorb Ki Attacks, Life Energy, Energy Weapons, and sometimes even Liquid Assets. The absorbed power may be part of a Charged Attack, it may be available to power the user's Tim Taylor Technology, it may be the result of an artificial Negative Space Wedgie, or the power may just be a specialized form of Deflector Shields. Found in both Anime and Speculative Fiction Series. Energy Absorption is usually, but not always, an example of Feed It with Fire. Compare and contrast with Adaptive Ability, which has a similar effect, but without the risk of Phlebotinum Overload. See also Elemental Absorption when this is done with Elemental Powers. Yakon, Androids 19 and 20 from Dragon Ball Z and Super Android 17 from Dragon Ball GT. In the Return of Cooler movie, Cooler hooked Goku and Vegeta up to the Big Gete Star that brought him back from the dead to drain their energy, and suffered the Phlebotinum Overload version of this trope. Yakon was taken down in a similar way. Inuyasha's sword later in the series. The antagonist of the first Bleach OVA could absorb spiritual energy. In canon, this is the case with Ukitake's Shikai, Nel Tu and Yumichika. Of particular note is the fact that Quincies use this to absorb ambient Life Energy and even steal it from their enemies in order to power their attacks. In the anime-only Reigai arc, this is Nozomi's true ability. Cue God Mode Sue complaints from the fandom. The prepubescent looking Hinako Ninomiya of Ranma ½ can absorb both Ki Attacks and Life Energy (causing her to transform into a curvaceous adult), and then return the energy in a ki attack of her own (causing her to revert to her child form). Kurau in Kurau Phantom Memory can absorb Rynax energy and let sentient Rynax return to their world through her. Constantly in Sailor Moon, especially in the first season where the evil plan of the week was always something related to draining Life Energy from a bunch of kids. The Guze no Tomogara in Shakugan no Shana maintain their continued, unnatural existence in this world by feeding on humans' power of existence. The first villain's evil plan is to go even further by casting a "City Devouring", a spell greatly feared for its ability to consume and convert everything into a huge supply of usable energy. Alv and Dvergr from Kiddy Grade can use this power to absorb any matter at all. One of Pain's bodies can do this in Naruto. Naruto counters by overloading it with nature chakra, turning the body into a frog statue. Kisame's sword Samehada has similar capabilities, and is capable of giving the chakra to its user to keep their stamina up and heal wounds. Yoroi (who absorbs through his hands), Jirobo (who absorbs through the sphere of earth he trapped his opponents in), Shino's insects, and Zetsu (through his spores) can also use this, but can only absorb chakra from the opponent directly, and not their techniques (Zetsu can also restore it to someone else). Evangeline and Negi can do this as well in Mahou Sensei Negima. The titular Tengen Toppa Gurren Lagann absorbs the energy of a big bang after it is converted into Spiral Power. Nanoha's Starlight Breaker in Magical Girl Lyrical Nanoha works by absorbing the residual energy left by magical attacks in a battlefield and firing it in a massive beam. This makes it both deadly and cost-efficient since it doesn't completely rely on a mage's own power, which is the main reason why Nanoha decided to teach it to Teana after StrikerS. Also, the Book of Darkness in A's was powered by the energy absorbed from the Linker Cores of various mages and other magical beings. Jegan from Rave Master uses a Dark Bring, Yggdrasil, which absorbs energy and converts it into plant-life. Busou Renkin's Shusui Hayasaka has a sword with this ability, apparently because the author was tired of seeing swords firing energy attacks. Saten from NEEDLESS uses his power of Energy Absorption and Release to simulate other abilities, such as freezing people and places by draining the heat from them, agitating molecules in the air to create enough energy to deflect other energy attacks, and unleashing giant energy beams of his own. Tsuna's Zero Point Breakthrough Custom/Revised absorbs others' Dying Will Flames and converts it to his own power. Part of Shin Getter Robo's ability to combine with anything includes this. The Getter's ultimate goal would presumably involve reconstituting the energy and mass of the universe back into itself. Rogue and Bishop from X-Men, in different fashions; Bishop's is the more traditional version. Also, Sebastian Shaw for yet a third variety; he absorbs energy to fuel his super-strength. Same with Strong Guy from X-Factor, but he has to release the energy he absorbs within 90 seconds, or suffer (even more) permanent distortion to his body. Oh, and he's in constant pain due to the existing distortion. If all that wasn't bad enough exerting his power too much puts strain on his heart (he had a near-fatal heart attack after absorbing the explosion of an alien bomb, and recently one punch from the most powerful incarnation of the Hulk threatened to put him back on the critical list). Wolverine's old buddy Maverick could absorb kinetic energy such as being punched by super-strong opponents or falling from great heights (although there was supposedly a limit as to how much damage he could absorb), and later learned how to channel said energy into energy blasts emanating from his hands or to fuel the power of his blows. However, he lost his powers after M-Day. The villain Lamprey, from the Squadron Supreme. 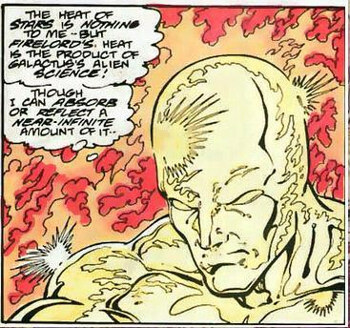 Captain Atom is able to absorb any form of energy, sending it back into the 'quantum field'. However, if he absorbs too much in one go, it catapaults him through time. Multiple Man's duplication power, Depending on the Writer, is based on a near-instant absorption and redirection of energy to restructure surrounding matter into a duplicate. Although, given the fact that the energy of a simple snap of the fingers was enough to forcibly break down and reassemble approximately 100 kg of mass, the opening number to West Side Story could probably end interstellar wars. Mjolnir can be used to absorb and redirect virtually unlimited amounts of energy. Thor has used Mjolnir to absorb Hyperion's atomic vision, the Silver Surfer's Power Cosmic attacks, and Heimdall's blue cosmic flames. Absorbed energy can be amplified 10 to 100 fold before being redirected at Thor's attacker. One of Mjolnir's greatest feats occurred in Thor #407, where the hammer managed to contain the galaxy-destroying power of a Null Bomb before using the power to reignite a dying sun. Paul in With Strings Attached. He doesn't know much about this ability, but after he was drained of a lot of his energy, he realized he was internalizing the heat from a fire and other things. In the Harry Potter fic Make a Wish, Harry acquired a sword that was always sharp and could turn into a scythe if desired. It got the power for this by draining "ambient energy" from living things in its vicinity, making plants wither and animals and people feel uneasy. Iron Man's suit absorbs Thor's lightning bolt in The Avengers. The Langston Field from The Mote in God's Eye absorbs any sort of energy - pass through one and it will slow you down and drain your body heat. The authors are very thorough about exploring the implications of this technology, and the rules of space combat in the setting are mostly controlled by the way Langston Fields absorb, store, radiate, and get overloaded by energy applied to them. The power of the black gelstei crystals in the Ea Cycle. Star Wars Expanded Universe had sufficiently advanced Force-Users with the ability to absorb lightning attacks without injury. Then again, their weapon can do the same thing. Someone should have told Luke, "Now, when you meet up with the Emperor, don't throw your lightsaber away. It can block Force-Lightning!" This editor recalls reading somewhere that the original plan was for Luke to deflect/absorb the Emperor's Force-Lightning at first, but the Emperor overpowered him, thus leading to the comment: "Your feeble skills are no match for me, boy." That's how it went in the novelization, and incidentally terrified the Emperor, because no young and mostly self-taught Jedi should possibly be able to pull that off. As well as this, using the same power, powerful Force-Sensitives can absorb blaster bolts. Then again, a lightsaber can deflect blaster bolts - the tricky part is to connect (which is where Jedi precognition helps). Energy absorption is one of the two theories about how Vader caught that blaster bolt in The Empire Strikes Back (The other is that he had an indestructible glove). A few Jedi in the Star Wars Expanded Universe, most notably Corran Horn, can also absorb heat energy and the power of a lightsaber's blade. In Luke Skywalker and the Shadows of Mindor, a stormtrooper hits a captured Luke Skywalker, who then says "Please don't hit me". When he's hit again, he breaks the blaster. Another tries to shoot him. Later models of Bolos, in Keith Laumer's Bolo books, have Deflector Shields which can shunt power from energy weapon hits to the Bolo's power cells. One short story features a Bolo which loses both its reactors to battle damage but is able to continue fighting since it's still getting shot enough to keep it powered. Wild Cards has the Amazing Bubbles, who can absorb kinetic energy and later release it in the form of detonating "bubbles." Thing is, the energy stores on her in the form of fat, and she's always absorbing kinetic energy, even by walking. Still, the fat storage is helpful, as she uses it to cover up the fact that she's a famous model. The space amoeba from the original Star Trek: The Original Series. The alien healing machine in Babylon 5. An alien space probe and a First Ones' ship are also equipped with Energy Absorption. After fighting the Asgard for some time, the Replicators gained the ability to absorb almost any directed energy weapon. A Human-Form Replicator stated that self-destructing a ship on a Replicator-consumed planet will simply provide them power. There were also the intelligent microbes from the episode "Message In A Bottle". It was determined that staff weapon and zat blasts fed them. When the self-destruct is activated, they tell SG-1 (through O'Neill, whom they'd taken control of so they could communicate) that the explosion would only feed them. The Ori planet shield in the episode "Beachhead"(though others are implied in future episodes) uses energy absorbed from attacks by other weapons (for example, a nuclear bomb) to expand and eventually collapse a planet into a black hole. The Stargate itself is one. Because it's made of naquadah, it can absorb a wide range of different types of energy (lighting, radiant heat) and use them to power itself. It comes in handy when normal power source is broken or lost, as was the case when humans first found it on Earth. If it absorbs too much energy, it will explode. The Master in Power Rangers Mystic Force does this. Game examples: Black Globes from Traveller and the Andromedans from Star Fleet Battles. Both are subject to Phlebotinum Overload. Tabletop RPG Dungeons & Dragons examples: Rod of Absorption (and Absorption spell) allow to consume incoming spells fuel one's own. Some oozes and suchlike amorphous creatures absorb elemental energies and use these to grow. Mustard Jelly absorbs magic missiles to grow. Brown Mold grows from heat (8x times spurt from a fireball), Shambling Mound from being hit by lightning. Lightning also causes Ochre Jelly to divide, but otherwise does otherwise neither helps nor harms. With golems and different damage types. Iron Golem hit by magical fire heals any damage it has taken. Flesh golems, in a Frankenstein reference, have lightning. The Expanded Psionics Handbook introduces the power Energy Adaptation that coverts 10 energy damage into light, Radiant armor that does the same, and the power Energy Conversion that allows you to store and release the energy damage that it prevents. Forgotten Realms with its metamagic arms race has extra magic-absorbing spells: Spell Engine (a shout-out to one of Jack Vance's works) absorbs all magic discharges around it and produces minor extra effects - it cannot "overfeed", but can be made to "choke" explosively. Thunderlance absorbs magic missiles to increase its own damage. Energy Transformation is a rare spell that consumes certain spells to power up others (which is how the Undermountain denies teleportation and some other effects while keeping up ridiculous number of its own magics). In GURPS the Absorption enhancement turns your Damage Reduction into a battery that you can use to heal yourself or improve any one of your primary stats. Mutants and Masterminds has a power for this, as with everything else comics can ever do. As do Champions, DC Heroes, MSHRP, Villains and Vigilantes, and pretty much every other superhero RPG ever made. The Utwig Jugger in Star Control 2 has a shield which refills its energy banks when shot. The penultimate light-side ability in Jedi Knight: Dark Forces II is Force Absorb, which converts offensive attacks against you into mana. The titular creatures of the Metroid series feed by absorbing energy from living things through an unknown process. According to the lore of the recent games their victims lose no blood or other bodymass but appear unable to survive without the energy the Metroids drain. Likely because it's draining the bio-electricity from the victim's brain/nervous system. Hard to survive when your brain can't tell the rest of your body what to do. This doesn't explain how Metroid victims turn to ash after getting their energy drained completely. Many enemies in Metroid Prime had beam-absorbing abilities. In Metal Combat: Falcon's Revenge, Zephyr's Cobra ST carries a shield that can absorb any attack you throw at him. If you shoot his shield again with a powerful blast while he's absorbing, it'll be destroyed, and he'll have to fight the rest of the battle with only his really big Arm Cannon. In the Super Smash Bros. series, Ness and Lucas have an ability called PSI Magnet which they can use to absorb energy attacks and use them to heal themselves. Mr. Game & Watch's bucket can absorb energy attacks (and turns them into flat oil). Absorb three and he can spill the full bucket of oil to damage opponents. In Final Fantasy VI, Celes has an ability called "Runic," which absorbs the MP of any single spell cast, completely negating the effect itself. This effectively means that magic is worthless until Celes absorbs a spell or selects a different action. It can be crippling to your party, or extremely beneficial. Several classes in World of Warcraft have limited absorption abilities, often of their primary elements. Mages can gain various sidebenefits with talents, such as absorbing mana or spellpower from the negated spells. Deathknights can use an Anti-Magic shield that gives them additional runic power when absorbing damage. Mages can also steal enemy buffs, although only for a maxium of two minutes. There are several of this style of power in City of Heroes, most of them simply drain health or stamina from nearby enemies to either heal or recharge the user. Then there is the Warshade power Eclipse, which drains stamina from nearby foes to increase the damage resistance of the user, and the titular Energy Absorption that allows an Ice Armor Tanker to drain stamina from enemies in order to boost his defenses. Sarara's block special in Magical Battle Arena, which creates a shield that will absorb most attacks that strike it, making them heal her instead. In Crysis it is said that the alien structure acts as a giant power sink draining energy of any equipment nearby to power itself up, guess what happens when they detonate a nuclear weapon hoping to destroy it. Master of Orion 2 has the Energy Absorber, which absorbs 1/4th of the damage from an attack in combat, and allows the equipped ship to fire it back like a regular energy weapon in the next turn. In Sword of the Stars, one of the "shield" sections availale is the absorber. It cuts energy weapon damage by 75% and uses that energy to recharge the energy-based weapons of the ship it's on. Ships with this section and an all-energy weapon layout are going to be duking it out for some time. There are also absorb magic, health and fatigue attacks. Ikaruga is defined by this concept, as well as Reverse Polarity. In Pokémon, the abilities Water Absorb, Volt Absorb, Flash Fire, and Motor Drive let you nullify damage of an enemy attack and use it to your advantage. The first two restore 25% of its user's HP per hit, while the others boost fire attacks and speed respectively. Moves like Giga Drain, Drain Punch, Dream Eater and some more, literally absorb the energy of your opponent, draining their HP and restoring yours. In Super Smash Bros., Mr. Game & Watch has an ability where he can absorb three projectiles in a bucket, later able to retaliate by pouring out the contents of the bucket. In the Touhou spinoff fighting games, Yukari can open a portal to absorb enemy bullets, which are turned into projectiles of her own which can be released using another ability. Project Eden has the extractor weapon which allows you to slowly kill enemies while charging your batteries. Champions Online has Lifedrain (ranged) and Devour Essence (melee) powers. The Fat Man, an unfortunately-if-appropriately named superhero from the Global Guardians PBEM Universe, absorbs kinetic energy. The kinetic energy gets converted to fat, thus increasing his resistance to injury. It also increases his height and weight. Chinese superhero Overpower can absorb any sort of energy at all. Doing so increases her already prodigious strength. Several Whateley Academy students in the Whateley Universe can absorb energy in one way or another. Buster can only absorb kinetic energy attacks. Blot absorbs all E-M radiation, which is why he looks like a living blackness; the more radiation he absorbs, the stronger he gets. Several characters, like Icer, absorb heat and can use that ability in an Iceman-like way. A couple, like Negator, can absorb or block whatever energy or phlebotinum powers other mutants' superpowers. And Lancer, a PK brick, can absorb energy attacks and fire tham back at his opponents. Parasite from Superman: The Animated Series. The 1966 Filmation series, The New Adventures of Superman provides a classic example of the abovementioned Phlebotinum Overload: Superman deals with the Parasite by letting him absorb his nigh-infinite powers until he simply explodes, fatally. Deliberately arranging for an enemy's death was seriously out-of-character for the Man of Steel. A reborn Solomon Grundy in Justice League Unlimited. The (almost-)MacGuffin in Titan A.E. turns out to be a world-creating ship capable of absorbing the Energy Beings who had destroyed the Earth. Though, technically, it wasn't designed for that, and had to be reprogrammed on the fly to do so. Kevin 11 in Ben 10 has this power for a time, at first only shown absorbing electrical power - until he meets the Omnitrix. Ben 10: Alien Force Example: Chromostone can absorb and then redirect energy. Redirection is usually done in the form of energy beams shot from the hands. The newest villain in Ben 10 Ultimate Alien also has these powers. Ironically, he's of the same alien race as Kevin. What's more, he's after alien powers too. However, his plan seems to be going over better than Kevin's did. Until Kevin absorbed his powers. Gigabyte from Re Boot. It turns out this ability was an aspect of the Web Virus that was combined with Megabyte and Hexadecimal to form Gigabyte. Bob refers to viruses possessing the ability as "Class 5". After Dr. Landon falls into his own mutant-destroying compound in Spider-Man: The Animated Series, he ends up mutating into a large green reptilian creature, and the only way to ease the constant pain he endures while in this form is to absorb electrical energy, which also increases his size. Bionicle: this is Vorahk's ability. The Nui Stone is able to absorb Toa Energy in a 3000 Kio radius and transfer it to a Toa. This page was last edited on 11 April 2017, at 09:52.